You can collaborate with your colleagues in real-time, both at a task and project level. To keep task updates in context, open the Full Task Details view of a task → go to the Comments section → Post a comment. Write your input, then check which assigned users to be notified using the "Notify users" icon. This way you avoid spamming users who are not directly impacted by it. The comment will chronologically appear under the Comments section, while all the assigned users will receive an email notification about it. 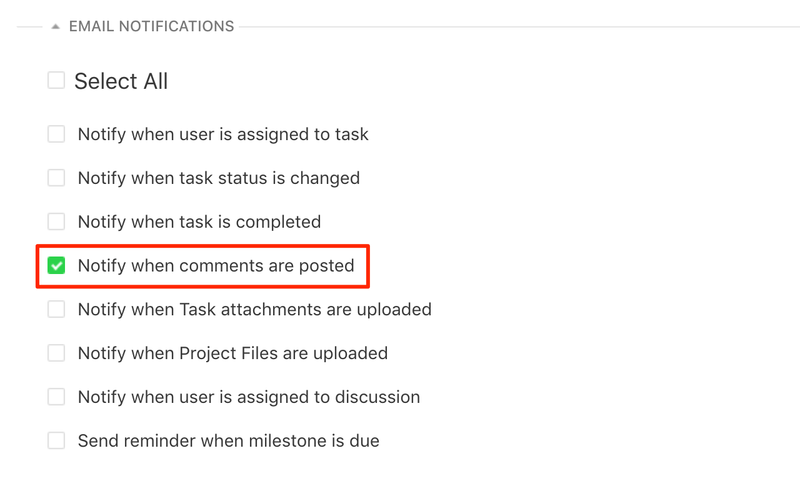 Note: To receive comment-related email notifications, be sure to check the "Notify when comment are posted" checkbox in Project Settings → Email notifications. You can also start a separate discussion at a project level using the Discussions tab, useful when you need to start a brainstorming session or to inform the whole team about a specific topic. To add one, go to Discussion → click on the "Add Discussion" button → set up a Discussion Name and Description → attach any files if necessary → and choose which users to be notified using the Send Notification dropdown button. Once created, you can post comments inside the discussion like indicated above.